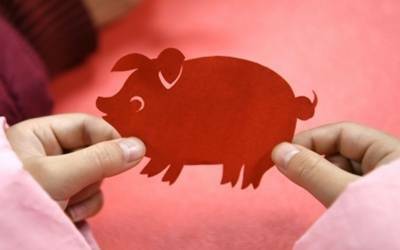 Beijing, Feb 4 (IANS) Streets and homes across China wore a festive look on Monday, adorned with red paper lanterns, good luck messages and images of the pig, to mark the Lunar New Year or ‘Year of the Pig’, which begins on Tuesday. Posters with new year greetings were put up across cities with the character "fu", which means "good luck", reports Efe news. Fu cut-outs, circled by a red square, could also be seen hanging upside down to indicate the arrival of wealth and prosperity. Many posters and greetings also carried imageries of the pig – one of the 12 Chinese zodiac signs – which is associated with fertility and prosperity. The animal will be the central figure in upcoming festivities, including a month-long lantern festival at the popular Yuyuan garden in Shanghai. Carole Zhang, a Beijing resident who follows Feng Shui, an ancient Chinese system that defines rules about architecture and the arrangement of objects for ensuring good fortune, told Efe that the character, a fundamental part of Chinese calligraphy, was known for association with happiness, success and wealth. During the Lunar New Year celebrations, most shops and restaurants will remain closed and the streets of metros like Shanghai and Beijing will likely be deserted compared with the rest of the year. On New Year’s Day "hongbao", or red envelopes filled with money, are gifted to family and friends to wish them luck. Carole said it was also a tradition to gift oranges and mandarins, symbolising prosperity, to family members and friends. Not doing so could be interpreted as disrespect, Carole added. The festive period is also a time of purification and people use the occasion to clean their houses and appearances. In what has been described as the world’s largest annual human migration, millions of people return to their home towns to celebrate the festival. Chinese authorities expect nearly 3 billion to travel during this period. Also known as the Spring Festival, the 40-day celebrations began on January 21 and will conclude on March 1.